Making puffy poori at home like restaurants is not a rocket science. If you add ingredients in the right proportion and if the heat of the oil is just right you will get a properly puffed up poori. At home our mom used to make pooris only with atta. While making some of them do get puffed up and some are flattened. That time I was rather amazed by seeing the puffy pooris made in restaurants. 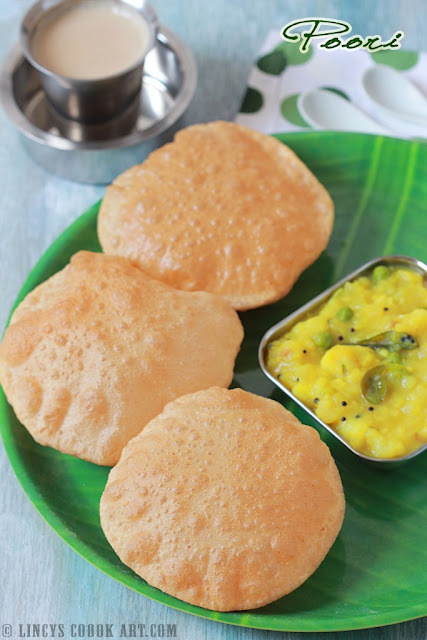 Following these tips i am sure you could make a tasty as well as puffed up pooris. I got this recipe from a TV show; the chef gave tips on how to come up with puffed up pooris. I have made these pooris using multi grain atta as i use that generally for making chapatis. Use normal atta/ whole wheat flour for better results. Then i tried the recipe at home and it was a success. Do try this recipe and let me know the outcome. In a bowl add a tablespoon of semolina and drizzle little water to soak up the semolina. Allow to soak for five minutes. Now add the wheat flour, a teaspoon of oil, sugar, salt on top of soaked semolina. Mix well with hand to roughly mix well. Now add water to make the dough. The dough should not be too stiff. It should be soft. Now transfer the dough on top a flat surface and knead to make a pliable soft dough. Do not rest the poori dough like chapatis start making pooris immediately. Now divide the dough in to 6-7 lemon sized balls. Sprinkle some flour and keep one ball of dough on top and roll using a rolling pin as a round pooris of palm sized. Roll the pooris little thicker than chapatis so that the pooris become puffier while frying. Heat oil well in a pan and reduce the flame to medium and start frying. Check the temperature of the oil by dropping a small piece of dough it should rise immediately. It should not become brown indicates oil is over heated. Drop the pooris one by one by carefully sliding on a side of the pan and start frying. When one side starts to get the deep golden colour turn the poori to other side using a knife or ladle and cook the other side. Keep the fried pooris on top of kitchen towel to absorb excess oil. Serve hot with Potato Masala or Channa Masala. Notes: Use enough oil to fry the pooris else the pooris start to become flat at some point. Do not use more than one or two tablepoons of rava/cup of atta. Adding more rava reduces the taste of pooris. Soaking rava makes the dough smooth and easy while rolling. Adding rava makes more crispy pooris which stays crispy for some more time. Sugar gives a nice golden colour to the pooris so add 1/4 to 1/2 teaspoon. Do not add much which makes the poori sweeter in taste and darker in colour. If you donot add enough water to knead the dough the dough becomes stiff and hard to handle. It further gives cracked pooris while frying and tastes dry while consuming. Do not dust with more flour which will burn and settles down. You could replace the oil added to make the dough with ghee for more taste and flavour. Lovely tips on color and puffiness.My aunt used to add sooji to make the poori stiffy but never knew the color one.Thanks for sharing this poori recipe.